Regular coffee contains caffeine, which not only stimulates your nervous system, but also acts as a diuretic. While consuming coffee in moderate amounts is likely safe for most people, drinking too much can have negative repercussions. The diuretic effect of coffee can cause your body to lose too much potassium, leading to a deficiency, which can be very serious. If you have concerns, talk to your doctor about your coffee intake and potassium levels. Potassium is imperative for bodily functions like smooth muscle contractions, heart health, digestive regulation and carrying electricity throughout your system. Both men and women need 4.7 g of the mineral a day, according to MedlinePlus. Many foods contain potassium, so if you become deficient, it will most likely not be because your diet does not give you enough of the mineral. MedlinePlus states that the most frequent cause of low potassium, or hypokalemia, is the use of diuretics, and this includes substances that act as diuretics, like coffee. The University of Maryland Medical Center defines a moderate intake of caffeine as roughly 250 mg a day, which translates to about three 8 oz. cups of regular coffee. Heavy intake consists of more than 500 mg a day. 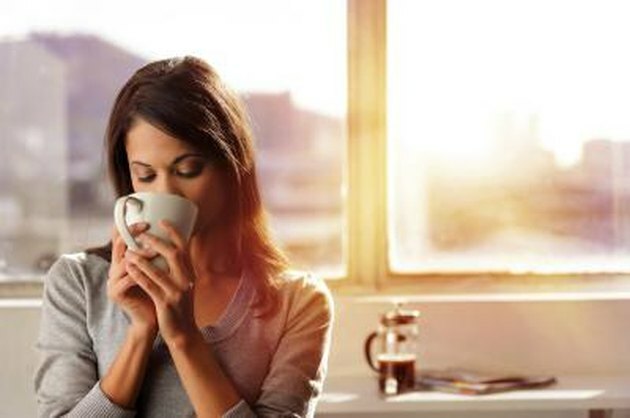 Signs that you are drinking too much coffee include trouble sleeping, feeling restless or anxious, having an upset stomach and developing a rapid pulse. You may also urinate more frequently due to the diuretic effect of coffee, which may in turn lower the amount of potassium in your blood. If you develop hypokalemia, you may feel fatigued or lack energy, develop muscle cramps, experience digestive upset or notice an irregular heart rhythm. This condition can be deadly, so if you suspect you have low potassium levels, seek medical attention immediately. Your doctor will most likely prescribe potassium supplements to restore your blood levels of the mineral. Tell him about your intake of coffee, and ask how you can safely cut back to avoid developing this serious condition again. Do not attempt to self-diagnose hypokalemia or begin taking potassium supplements without a doctor's approval. Taking these supplements can result in side effects like stomach upset and diarrhea. If you take high doses of potassium supplements, you may experience muscle fatigue and a slow or irregular pulse, and you will also be at risk for developing hyperkalemia, which is excess potassium in the blood. Always discuss dosing with your doctor prior to consuming new supplements, and tell her about other medications you are on to avoid potential interactions.